The Migration Legislation Amendment (Regional Processing Cohort) Bill 2016 passed the House on 10 November and is now in the Senate. If passed, it means that anyone who was aged 18 and entered Australia as an 'unauthorised maritime arrival' after 19 July 2013 and was taken to Nauru or Manus Island would be forever blocked from applying for any visa to come to Australia. The statutory bar could only be lifted personally by the Minister if they think 'it is in the public interest to do so'. There are already five statutory bars preventing asylum seekers who are in Australia from lodging any visa, unless the Minister permits them to do so. The decision to lift the bar is the Minister's only, it cannot be delegated to a bureaucrat. There already is a bar on applications for visas for those deported under s200 for criminal matters or those whose visas are cancelled on character grounds. However this is the first time that a statutory bar will be created for a life ban, regardless of the person's citizenship or the visa they are seeking simply because they arrived in Australia by boat after a certain date. In a press conference Dutton said the purpose was to prevent sponsorship for sham marriages. This was odd because there is already considerable law to deal with this issue. Firstly, it is already a criminal offence to falsely apply to sponsor someone as a spouse. Secondly there are a number of strict requirements for both sponsors and the visa applicants to meet in order for a partner visa to be granted. The family program has 57,400 places, with probably around 65-75 per cent of those visas being for fiancé visas and partner visas and dependents. Therefore on a conservative estimate the Department assesses around 35,000 fiancé or partner visa applications every year for genuineness already. If the Department has doubts, they will commonly interview applicants. Given this process already exists, why do you need to prevent anyone accessing it if they wish to come to Australia to be with their partner? When asked, the Minister claimed 'this government won't tolerate the law being subverted, we're not going to allow the system to be gamed because that is unfair on others who are waiting in queues'. What queues? There is no limit on the partner visa category, unlike the refugee visa category. People are not in queues because the processing time differs from country to country, and may also depend on the complexity or the documentation in a case. "The laws to assess these applications exist and one wonders why the Minister does not trust his own officers to make a decision on the alleged 'sham marriages' under the existing laws. This change is purely punitive." The partner visa process is not straight forward, and certainly not cheap. Just the visa application fee is $6865, making it one of the more expensive visa applications. A skilled visa for example is $3600. This is without other costs such as medicals. It is a two stage process: a temporary visa is granted first and then, two years after the application was lodged, you can be considered for the permanent visa. The genuineness of the relationship has to be reassessed at the end of the second stage in order to get a permanent visa. The Department has produced a 59 page information booklet about these visas. So given all these existing checks and hurdles, why have a ban at all? The change would only affect about 2000 people; the other 35,000 who came by boat before 19 July 2013 or were not sent to Nauru and Manus Island are not affected. This illustrates that the true intention of the Bill is to yet further punish the people we dumped on our poor Pacific neighbours. The Bill also creates other statutory bars to prevent applications for say visitor visas, student visas or business visas, even from those holding passports from countries to which we give priority processing. This includes all the EU, Canada, the USA, Japan, South Korea and a few other countries. New Zealanders just need to present their passport to enter Australia, and declare they have no criminal convictions to be allowed to enter and stay forever if they so desire. However under this drastic change, regardless of what happens to the 'cohort' in the future, or if they become citizens of another country — if they ever what to visit Australia, they will need the personal intervention of the Minister to even apply for a visa. This is a lifetime ban. There is no relationship between seeking asylum on or after 19 July 2013 and years later seeking to be sponsored as a partner, or a skilled migrant. Someone may meet the protection visa criteria as a refugee, or maybe the skilled visa criteria. Maybe they will later meet the partner visa criteria. The laws to assess these applications exist and one wonders why the Minister does not trust his own officers to make a decision on the alleged 'sham marriages' under the existing laws. This change is not needed and is purely punitive. So an Australian citizen who has a partner who came on a boat in the 'Regional Processing Cohort' will be unable to even sponsor their partner unless the Minister lets them. If they have children, then the children will be Australian citizens, and presumably prevented from being reunited in Australia unless the Minister lets them. Kerry Murphy is a partner with the specialist immigration law firm D'Ambra Murphy Lawyers and member of the board of the IARC . Recent articles by Kerry Murphy. Can white South African farmers be refugees? Thank you, Kerry! The vicious absurdity of this needed to be set out and you have said it well! I watched Peter Dutton making his case during Question Time in parliament. Even he didn't seem convinced. What on earth is going on? Is our civil, reasonable and intelligent PM going to cast of the mask and reveal himself as Dr Evil? What can we do about this? Gillard and Roxon thought to be ever so clever when they were denied the right to traffic and trade humans to Malaysia so the Pacific solution mark 11 was done with the complete deletion of all human, legal and civil rights. Thank God for Cathy McGowan and Andrew Wilkie and their like. Peter Dutton was probably challenged enough on the beat. "It is poor legislation because it is discriminatory..." Is there any legislation which is not discriminatory? Is not discrimination sometimes very wise and even necessary? Is it not true that all discrimination is not discriminatory? Time everyone stopped playing with words (such as "queue") in this whole debacle. On the law of averages and considering refugees are human beings there are bound to be wheeler-dealers amongst them. Perhaps some discrimination is essential. This article is excellent in detail. The proposed lifetime ban on innocent people ever entering on Australian soil is immoral, let alone unethical. Freedom of movement for human beings is a basic right.and this law punishes innocent people yet is aimed at people smugglers - the end does not justify the means. Refugees in Nauru and Manus Is. are not criminals, they have no convictions. One wonders whether the current prisoners on Manus and Nauru will be permitted by Trump to enter the US under the deal struck by Turnbull and Obama. And what is really behind the reciprocal Costa Rica trade off? Maybe they are not Muslim. Hence less likely to cause trouble down the track.Trump has indicated a pending tough stance against future Muslim immigration following attacks in France, the US, Nairobi. Dutton appears to be holding the line. Talking tough as usual. I also wonder since they are offering 20 year sweetener visas in Nauru, what would happen if those refugees took citizenship in Nauru and Manus and then applied to enter Australia or NZ? It would seem a long process but they could hardly be refused. The irony is in the mode of transport. Thousands of Chinese illegals have entered on containers through the major ports undetected. Plenty of small planes fly undetected from PNG to Australia. It all depends on what one can afford. Thank you, Kerry, for explaining a system which is fraught with extreme confusion at best. The rhetoric of this latest and inaccurate proposition has now identified another 'horde' of queue jumpers: sponsored partners 'subverting' the family visa system (let’s not just limit this to 457s, non-productive elderly parents and asylum seekers). Many of the recent changes to our immigration program have been about heavily regulating it, to its detriment and justifying the changes on unfounded fears through political spin and clear misinformation. Whilst Australia, as a sovereign nation, has the right to do what it thinks best for its people and its borders, it also has the responsibility to do it truthfully and for the common good, not at the expense of human and civil rights breaches, separating families and proposing that we turn off our ‘social justice’ switch and ignore our sense of gross inequity when targeting those who have no voice to defend themselves or set the record straight. Peter Kiernan. You say "Freedom of movement for human beings is a basic right". Does that mean that none of us need our passports anymore and all visas are "immoral and unethical"? John, your argument appears to be that because there are 'wheelers and dealers' whatever you mean by that, that a select group should be permanently banned. So if in a group there are people who may do something wrong in the future, that means it is ok to collectively punish the whole group. I may have misunderstood your point, but on my reading it seems incredibly harsh. What I am alluding to, Kerry, is that genuine refugees (the vast majority) should not be disadvantaged by others who may have "wheeled and dealed" to arrive in Australia. Examples might be the Sri Lankans who chose to voluntarily return to Sri Lanka (presumably not fearing dire consequences) and some domiciled for some years in Indonesia before paying a people smuggler to drop them here by boat. These are not people who "might do something wrong in the future" but have paid no heed to this country's requirements for immigration (doesn't really matter whether we approve of the requirements or not - they are facts). I believe that we should be allowed the discriminatory capacity to ensure that we take those who are genuinely escaping persecution. John - 2 points - the way someone arrives seeking protection is IRRELEVANT to the refugee criteria. Just read the definition and tell me where it says how you arrive, or whether you move to another country is a relevant factor in determining whether you met the refugee definition. secondly - the point of the article is to question the stated reason for this draconian Bill - which bans any visas for life - not just refugee resettlement - any visa. Kerry. I do think that leaving the future decision to allow a visa to a single minister is very bad. We could have, God forbid, many Duttons or Hanson clones in the future who might find themselves invested with this singular power to deny humane re-union for example. I imagine that in the chaos of seeking refuge from prosecution some families suffer separation with some members being granted asylum and others lost in the no-man's land of detention. Surely there should be no ban on reunification of such people. It would seem that perhaps there are deficiencies in the law governing refugees if no account is taken of the manner of entry to another country. It seems to mean that you or I could quite legitimately enter another country by boat at night, walk up to the local police station and seek asylum and it wouldn't matter one iota if we were not genuine refugees but simply wanted a change of scenery or greater opportunity. I am not at all suggesting that the majority of asylum seekers fit into such a mould but I do think the law should embody the discriminatory capacity to deal with those who seek to rort the system in some way as it does in many other areas. It remains true I think, that Australia does take refugees and makes available social services unlike many other countries. The numbers affected by this latest visa fiddle would not seem to be great when placed in the overall picture. Perhaps there are reasons for that to which we may not be privy because of things like security concerns etc. Governments keep so much from our collective ken these days! 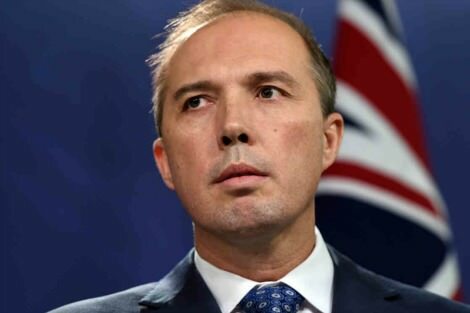 Just another smokescreen by Dutton to keep the door slammed shut on Manus and Nauru refugees. There is obviously a lot of political mileage in beating up the "sham marriage" application idea. Dutton's not the sharpest tool in the Liberal shed. The government has struck a deal with the USA which provides hope at last for the 1600 proven refugees on Manus and Nauru. There's still a lot of work to be done before these refugees can get on with their lives after three years of hopeless agony. Gone are the days of presuming that those who arrive without visas are in direct flight from persecution. Gone are the days when they get first option on the available humanitarian places. I welcome the government's decision, and await the detail.